I looked over my shoulder during the last Hypergrid Safari tour and saw this. More pics from that tour here. Between 2010 and 2012 I had a lot of fun organizing and running the Hypergrid Adventurers Club (HGAC) meetings. 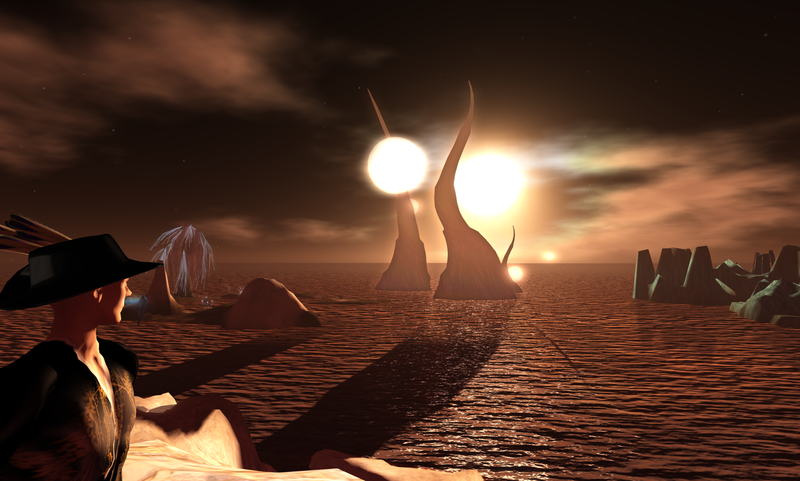 Those were the very early days of Hypergrid connectivity in Opensim, and things often went awry during our explorations. We all helped each other out through crazy technical challenges and exciting adventures, but it was the community of wonderful people at these meetings that impressed and amazed me the most. Time moved on and in 2012 I stopped organizing Hypergrid Adventurers Club meetings. Not because of any lack of interest in Opensim and the Hypergrid on my part, mind you. I’m still very excited about the future of Opensim and the Hypergrid, and I continue to explore and experiment a lot on my own. It was just that I felt the HGAC had run its course. Opensim was becoming much more stable and easier to use, hypergrid jumps were becoming very reliable, and directories of great places to explore were expanding (see Hyperica and OpenSim World). Also, attendance was gradually declining, and other aspects of my life were getting busier, so I figured it was time to wind things down. But when one flower closes, a new one blooms. That’s the true beauty of online communities. Healthy ones change and grow. I’ve been attending these trips and they’re fantastic. The organizers are Thirza Ember, Fuschia Nightfire, Wizard Gynoid and Wizardoz Chrome. I think all of them bring beautiful new perspectives to exploring the Hypergrid, in particular the perspectives of skilled content creators and innovative artists who have a long history of pioneering work in Second Life and other virtual worlds. And everyone attending brings their own thoughtfulness and great sense of humor to the group. Once again, it’s the community of people that impresses and amazes me the most. 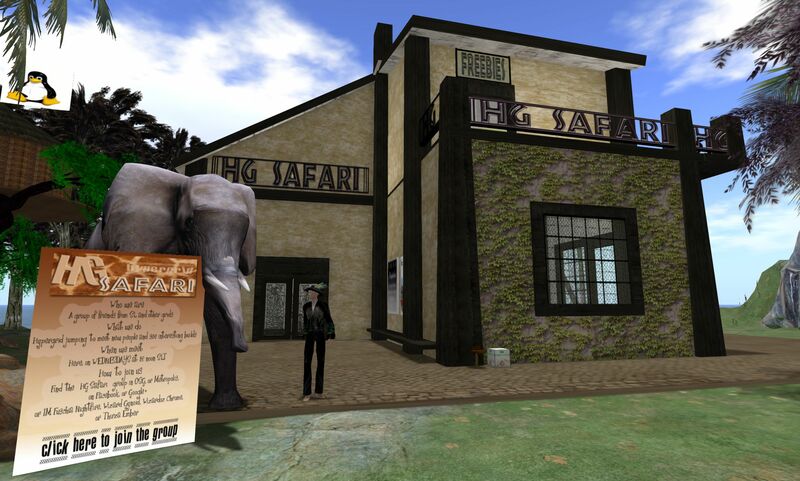 Join one of the Hypergrid Safari tours happening every Wednesday at noon Pacific Time departing from the Hypergrid Safari HQ on OSGrid. 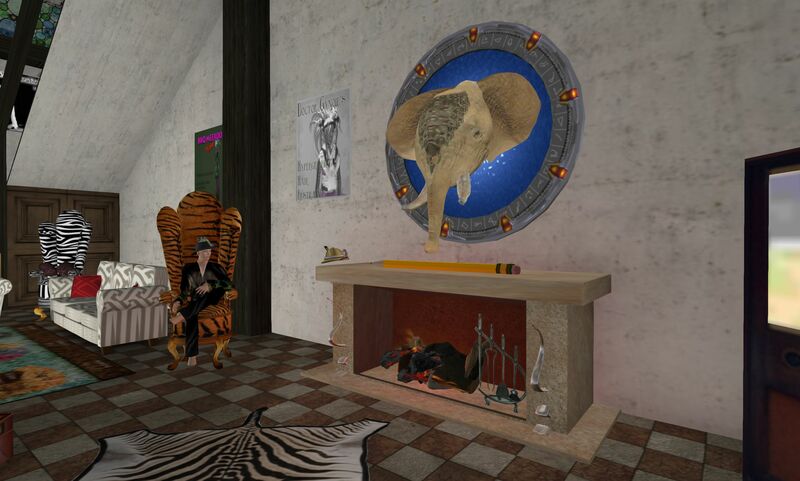 Inside the Hypergrid Safari Clubhouse. I love the elephant trophy mounted on an old hypergate. And here’s a great video by Nina Camplin of some recent tours. Take care, and hope to see you inworld!